When its time to hire a contractor there are a few important questions to ask them beforehand. Some may think it’s “how much are you going to charge me?” or “how long will this take?” Both are important questions. However, one of the most important questions is “do you have liability insurance and workers’ compensation?” Most people don’t consider this when hiring and it could put them at serious risk. “New York’s Labor Law can make you responsible for injuries to construction workers or others engaged in many of the service activities involving construction and repair on your premises — like painting, landscaping, cleaning, repair and renovations. Even maintenance work can be covered by the statute. (Harleysville/Nationwide)” Even if an unsafe working condition is happening without your knowledge, you can be financially responsible. New York is the only the state that has such a law. This law does not provide for any consideration of the injured employee’s fault — essentially rendering homeowners to be presumed at fault even if the worker’s negligence contributed to the accident. This law should be taken seriously because it could leave you, the homeowner, at major risk if something were to happen. 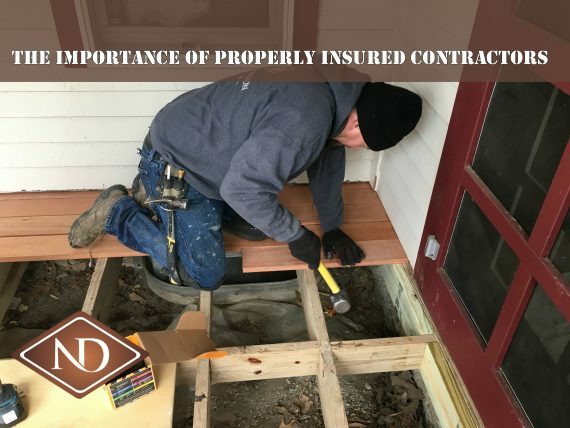 First of all, if a contractor or one of the subcontractors gets hurt/injured while working on your property without workers’ compensation, that could put the homeowner at risk of a lawsuit. If a contractor’s employee gets injured at the job-site without workers comp, the homeowner’s insurance policy may have to cover the cost to pay the workers’ claim. Your insurance company would not want to pay this claim and would likely increase your rates. Most contractors that work for much cheaper rates by comparison, usually can afford that because they choose to not pay for workers’ comp, general liability or property insurance premiums. As a homeowner though, the risk is too high to hire someone without insurance. Mistakes and accidents can happen. If the company hired does not have insurance, the homeowner is then open for a potential lawsuit or having to pay for any further possible damages. Liability insurance will protect the homeowner if the contractor causes damage to your home. Therefore, the homeowner will not have to expend more money if the contractor makes a mistake and causes further damage to their home. If an accident occurs who repairs your floors, your walls, your ceilings from the additional damage? Do you expect the contractor who chose not to purchase insurance coverage, to now spend additional money to cover repair costs for their mistake? You will also need replacement materials to fix the new issue and who is going to pay for that? Will you have to report a claim on your home policy and if so, who will pay the deductible? You could end up having to take your contractor to court for damages, but then you will have to pay attorney fees. There are so many possible outcomes that could leave you paying even more money than intended just because a contractor came in a bit cheaper, not having the right coverage. Always ask for proof of insurance, and make sure that your contractor has the proper licensing, if necessary in your state, before hiring. It is not a guarantee that things can’t go wrong, but is in your best interest to protect yourself. Hire the contractor that may be a little more expensive but has the proper insurance and licenses. Make sure you receive certificates of insurance before the project begins. The general contractor should verify that the subcontractors they hire are also insured. So, it is best to cover all your bases and make sure that you, as the homeowner, are not liable for any injury or damage done. Your best bet as a homeowner, is to take the safer course by hiring a professionally insured contractor. The cost of hiring an uninsured contractor can be tempting, but if they are taking the cheaper way out when it comes to insurance, might they not do the same when it comes to completing your project. They could easily start cutting corners and buying cheaper materials that could be detrimental to your new project lasting for years to come. 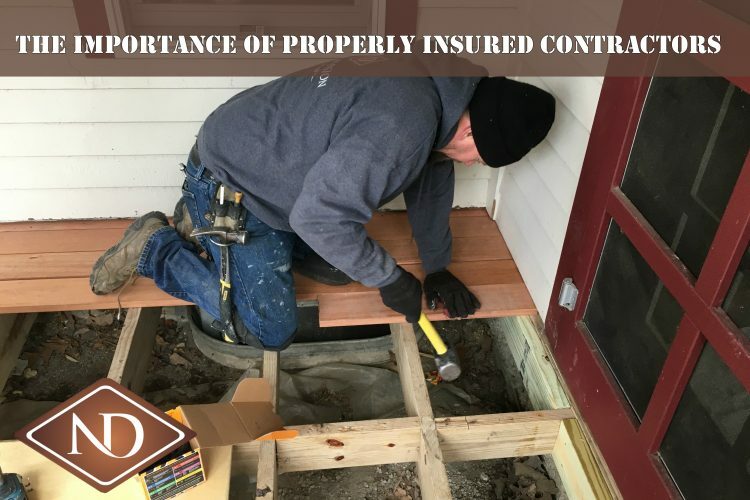 It is best to eliminate the risk as much as possible, hire an insured, licensed (if necessary) contractor and protect yourself from further possible liability.